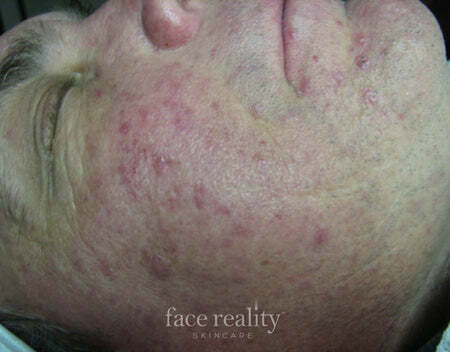 Pyoderma Faciale is related to stress hormones. It tends to affect only the face in women during their 20′s to 30′s and is characterized by large, very red painful lesions that occur mostly down the middle of the forehead, cheeks and chin. You can see the pattern in the photograph below – notice how the inflamed lesions are only in the center of her face. Her cheeks are completely clear. This condition can affect women who have never had acne in their life and then they have this horrible breakout right after a very stressful time in their life. Talk about a double whammy!! We treated our client with our l-mandelic serums which have antibacterial and anti-inflammatory properties, and benzoyl peroxide. During the day we had her use an oxygen emulsion cream (called h2O2) which is an antiseptic moisturizer that uses oxygen to kill bacteria. 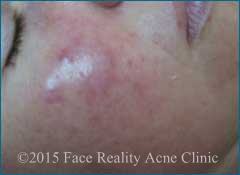 The right products can help to get this devastating form of rosacea under control.